After you have figured out what meaningful work you’d like to do in retirement, then you have to figure out what financial vehicle will get you there. These kittens have the essential: a taxable investment account, a 401(k), and a Roth IRA. The Roth IRA account allows them to pay tax now on the money and not when they’re taking it out. They need to have earned income to put money in this account (or have a spouse earning income), so they work a full time job in this man’s house. Each year they put in the maximum amount allowed. The 401(K) account is provided by their employer and their employer offers a match. These kittens take that match every year, putting in the percentage necessary to earn the biggest match. The taxable investment account they opened with a broker and is where they put all the rest of their savings. They don’t spend out of this account and keep it fully invested in the markets to get the maximum gain. Because of their effective use of these investment vehicles, they are on track to a very stable retirement. 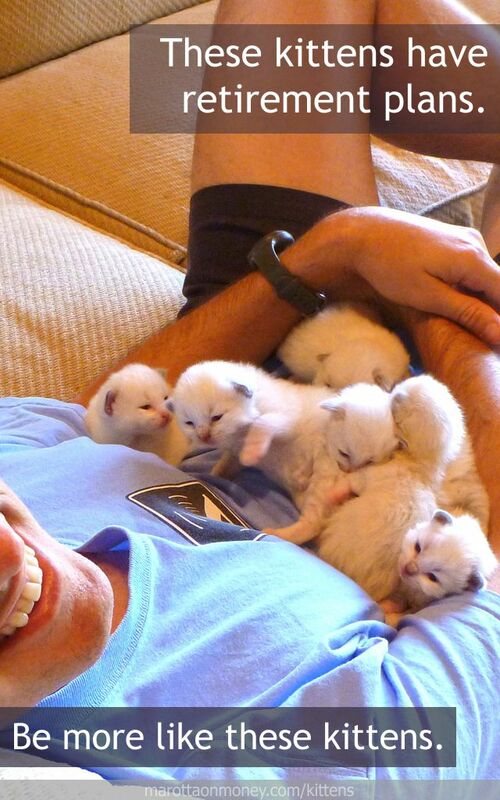 Photo of Snowy’s kittens taken by Steve Jurvetson and used here under Flickr Creative Commons.